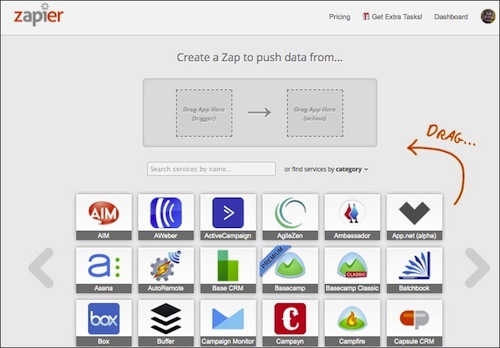 A rather new service called Zapier is poised to change how people work on the web. I know this sounds like a bold prediction, but here’s why I think it’s true. Web apps are awesome. In many ways they’ve given even the tiniest of businesses the ability to compete, manage and grow on a global scale. Tools like Basecamp, Evernote, Wufoo and Dropbox have made business life far more productive and enjoyable for what amounts to pennies in the big scheme of things. But, a funny thing happened once we got hooked on all these tools. Suddenly we needed them to all work together. We wanted seamless integration so we could simply use these tools in harmony to do the things we needed to do. The only problem is that integration takes work. In some cases developers created open APIs and other developers created plugins and add ons that let tools talk to each other. In other cases people wrote their own integrations. And then there were instances where we just had to compromise and not use a tool or do some element by hand to get data from one place to another. And this is where Zapier is stepping in. Zapier is creating what could only be called an integration library. It’s a growing collection of APIs for some of the most popular apps making it very easy to integrate one tool with another without the need for any technical intervention. Want to have GoToWebinar sign ups entered into MailChimp follow-up sequence? Want to have Wufoo form data passed to InfursionsoftCRM? Want Twitter to IM you when you get mentioned? Want Basecamp to add appointments to Google Calendar? All of the above and more (over 100 apps currently) is accomplished using the simple Trigger and Action integration of Zapier. While it’s possible for existing app makers to simply write integrations, they may have a different motivation for the ones they might support. Salesforce, for example might write integrations for many of the other apps they own, but would they really support integrations with competing apps? The app agnostic 3rd party offers the best opportunity to work exactly as we wish. My guess is some of the smaller app makers who can’t support multiple integrations are pretty happy to see this tool. The magic of Zapier in my mind is that not only can you automate many little things, (IFTTT.com does that part as well) they have also cracked some of the more popular and more complex apps such as Hubspot, Infusionsoft, GoToWebinar, Basecamp, Salesforce, PayPal and ZenDesk as well as most of the popular Email Service Providers. There is a free version that may very well serve the needs of most users and several paid versions for those that find value in extending the functionality of the tools they already pay for. This might be the point where I need to add that although I’m gushing about this tool I have no financial interest in promoting it! – It just does some things I’ve been wanting for some time. Zapier lets you create connections that will push data from one app to another using triggers and actions. They call these connections of integrations “Zaps.” Here’s how you set up an integration. Create a Zap: Zaps are the connection between two services made up of a single trigger and a single action. As a user you simply drag your trigger app to a dashboard and define it and then drag your Action app to the dashboard and define it and once Zapier has your log in information for both it simply monitors for the trigger and completes the tasks assigned. My biggest request at this point would be the addition of a library of actual user integrations. Seeing how others are using the triggers and actions would be very informative and allow people to more quickly create more useful integrations. The ease of use is definitely one of the most attractive features and should prove to be a sustaining factor as others jump into the integration end of the pool.